Janice Eileen Chmelyk was born in Fort St John, BC on September 6, 1941 to George and Elizabeth Ollenberger. In 1957 Janice married her true love Victor. Their journey of life together began on a farm in Golata Creek, BC. They were blessed with four children, Rick, Lori, Rob and Terry. 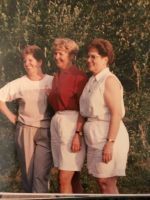 Vic and Janice relocated to the Baldonel area near Fort St. John, BC in 1978 and resided there until Vic retired in 1997 when they moved to Westbank, BC. 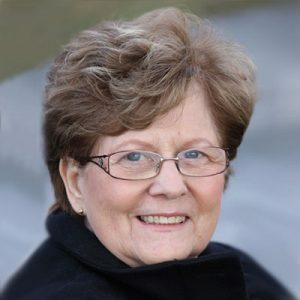 Janice enjoyed many years in the Kelowna area with family and friends until her passing on January 12, 2019. Janice is survived by her loving husband Vic, children Rick (Bernice), Lori (Rick) Lang, Rob (Colleen), Terry (Sonya), grandchildren; Robbie, Ryan, Alisa, Justine, Beth, Cheree, Becca, Erick and Jaydia, seven beautiful great grandchildren as well as one brother, three sisters and several brothers and sisters in law. Janice is predeceased by her parents George and Elizabeth, three brothers, three sisters and sadly her young grandson Micheal. Janice was a very hardworking and creative person who will be remembered for her many gifts and generous personality. Her loving and caring nature, big heart and beautiful smile will truly be missed by all of us. To the world she was a wife, mother, grandmother, great grandmother, sister and friend, to us she was the world! A celebration of life will be held on Friday, July 12, 2019 at 1:00 pm at Springfield Funeral Home, 2020 Springfield Rd. Kelowna, BC. Expressions of sympathy can be made to the Alzheimer’s Society, www.alzheimer.ca. I’m very sorry for your loss. Aunty Janice was a wonderful lady 💖She was always welcoming and made you feel at home!! Victor and family our heartfelt condolence over the loss of a wonderful person. Janice will be missed by her immediate and extended family and all who knew her. Our condolences to the Chmelyk family. Janice was a beautiful lady! She will be missed! Condolences to all of the families. My condolences to your family. It has been some 43 years since I had the pleasure of meeting Mrs. Chmelyk and Family . “Carry our on 2, Rob” and I apologize for “breaking the rototilor”. Our sincerest condolences to the family. May your memories of a wonderful lady give you comfort. Our sincere condolences to the family on your loss. My deepest condolences to Vic and all the family. Janice will sincerely be missed. I remember Janice very well even though I have not seen her in several years. We were at Vic and Janice’s wedding. Much love to the family.